A scissor lift is one of the several styles of aerial platforms. These lifts extend straight up from the base, offering a stable platform on which people can perform any types of construction or maintenance tasks. 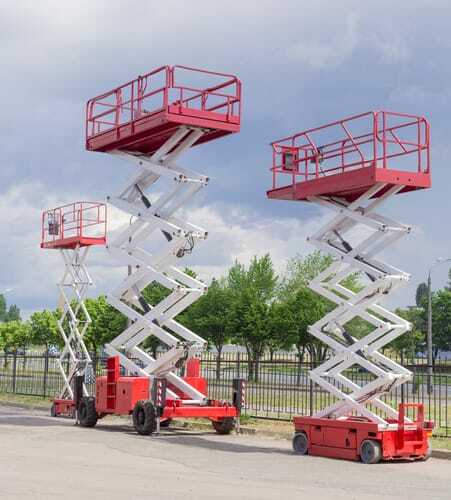 The modern scissor lift has been in existence only since the 1970s, but it’s a popular type of aerial lift suited to many indoor and outdoor jobs. In this article, you’ll learn about popular scissor lift manufacturers, popular models and features, and the history of the scissor lift. Get more information about when to use a scissor lift, the safety hazards associated with scissor lifts, and how knowledge and training can help you avoid any workplace accidents. 11.0.1 How easy is it to maneuver a scissor lift? 11.0.2 What if I rent the wrong size scissor lift? 11.0.3 Do I need to worry about workplace accidents? 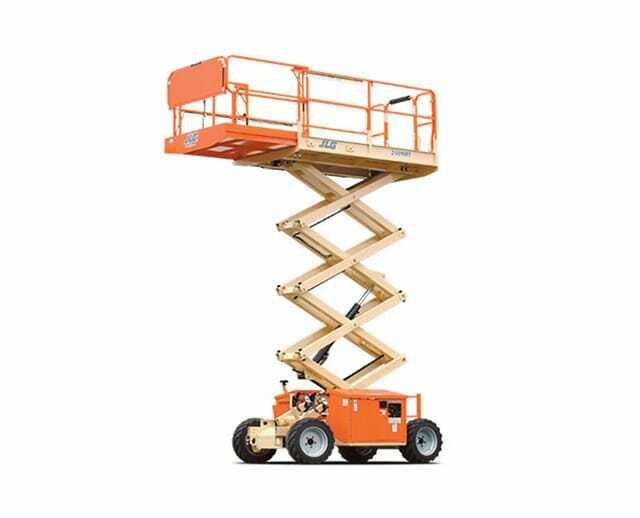 11.0.4What are my scissor lift rental options? Several companies in the United States and abroad manufacture scissor lifts. Although you’ll find many scissor lift types to choose from, BigRentz presents information on the following companies which produce the highest quality scissor lifts. Since JLG Industries was the first company to produce the scissor lift domestically, the company has been working to perfect its design for decades. JLG was founded in 1969 by John L. Grove, and in 1970, it manufactured the aerial platform, which revolutionized the lift industry. JLG’s headquarters is in McConnellsburg, Pennsylvania, although the company has locations around the world, including Latin America and Russia. The only two U.S. manufacturing locations are in McConnellsburg, and in Orville, Ohio. Manufacturing also occurs in France, Romania, Belgium, and China. JLG offers two types of scissor lifts: electric scissor lifts and engine-powered scissor lifts. Electric scissor lifts have an electric drive that doubles the battery life compared to a hydraulic scissor lift. JLG electric lifts are ideal for use indoors, and three series of designs (ES, R, and LE) provide you with different height and width options. Platform heights range from 15 ft to 40 ft, allowing you to reach working heights between 21 ft and 46 ft tall. Machine widths range from 2 ft 6 in to 5 ft 9 in. Engine-powered scissor lifts have larger lift platforms and increased capacity and generally can lift more weight than a boom lift. With rough terrain wheels, they’re your choice for outdoor work that requires a scissor lift. Between the JLG 260MRT model and the LRT series, platform heights reach from 26 ft to 53 ft, giving you working heights of 32 ft to 49 ft. These platforms offer a large workspace: the smallest is 5 ft 9 in, while the largest is 7 ft 9 in. Genie began in 1966 with Bud Bushnell and a compressed air lift. In 2002, the Terex Corp. bought Genie but had maintained the Genie brand, and the quality lifts it produces. Genie’s U.S. headquarters is at the Terex AWP main office in Redmond, Washington. Slab scissor lifts operate electrically and work both indoors and outdoors. They are easy to maneuver in small spaces and notable for making little noise. Working heights on slab scissor lifts range from 21 ft to 46 ft. The lowest lift capacity is 500 lbs, while the highest is 1,500 lbs. Rough terrain scissor lifts are made for outdoor construction sites. These lifts have four-wheel-drive and large platforms, making them ideal for difficult outdoor job sites. Working heights range from 32 ft to 59 ft. Some of these machines can handle a 50% gradient and still lift you securely and safely. The lowest lift capacity is 800 lbs, while the highest is 2,500 lbs. The Skyjack company has been around since 1985. Skyjack’s innovations include the scissor lift swing out component tray and narrower, higher platforms on certain lift models. In 2002, the Linamar Corp. bought Skyjack. The global Skyjack headquarters are in Guelph, Ontario, Canada. As with other lift companies, Skyjack produces electric and rough terrain scissor lifts. The company’s DC electric scissor lifts are capable of reaching work heights from 21 ft to 44.7 ft. Skyjack’s rough terrain scissor lifts have four-wheel-drive and use either a diesel engine or gas and propane dual fuel. Work heights range from 32 ft to 56 ft.
MEC began in Mayville, Wisconsin, in the late 1970s. The company originally manufactured scissor lift products. By 2008, MEC was responsible for being an industry pioneer with medium and large electric and rough terrain scissor lifts. Today, MEC is responsible for innovation in aerial lifts, including the 4069 ERT, which has the lowest stowed height of its segment. MEC offers slab scissor lifts, midsize rough terrain scissor lifts, and large scissor lifts. The slab scissor lifts come in micro, slim, and compact. These scissor lifts are ideal for a variety of indoor uses, although the slim and compact scissor lifts are also appropriate for certain outdoor uses on flat terrain. MEC midsize rough terrain scissor lifts and large lifts are ideal for your outdoor jobs. The Speed Level Sigma Lift is categorized as a scissor lift, although instead of the typical X pattern, it uses one folding arm to raise a large platform. 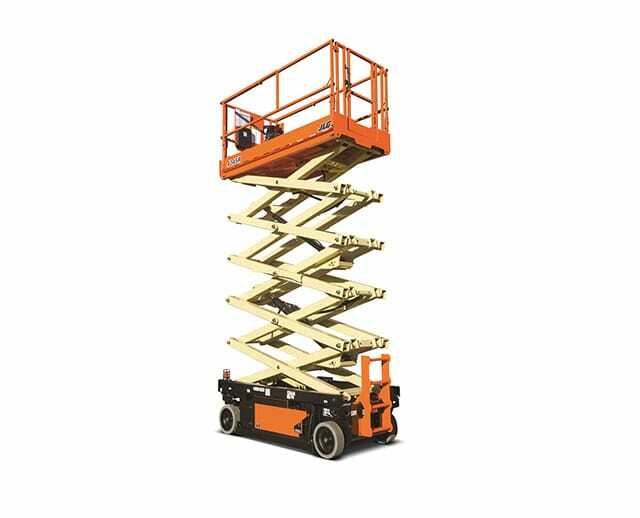 It still operates similarly to a scissor lift in that it extends straight up and can handle ground gradation. Other popular scissor lift brands include Haulotte, although dozens of brands worldwide produce scissor lifts that you can rent. The most popular scissor lift models include recognized brands, features that typical job sites need the most, and resale value. In the resale market for all scissor lift heights, Skyjack dominates, with JLG and Genie coming in second and third. These brands consistently produce quality equipment and can manufacture much of it. These three top brands also produce the most scissor lifts in the 41 ft to the 50 ft category. 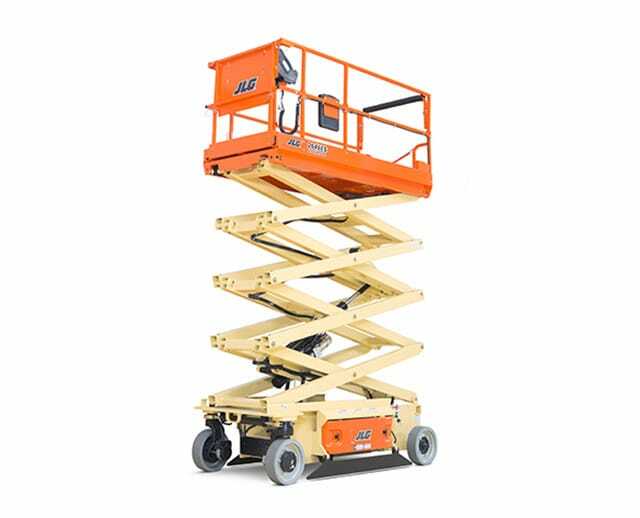 The JLG 1930ES is a small scissor lift with a lift platform height of 18 ft 9 in, and a total width of only 2 ft 6 in. Fit through doorways and in tight indoor spaces with the JLG 1930ES, the smallest of the ES series and JLG’s electric lifts. This model is popular for its quiet operation and its easy maintenance. It has four hydraulic fittings, and two hoses, which JLG reports will leave you with fewer maintenance calls than other models. JLG no longer manufactures the 2630ES model. It had a platform height of 25 ft 6 in, and a width of 2 ft 6 in. You may still be able to buy used JLG 2630ES models or rent them for your job sites. However, the JLG 2632ES is similar. It rises to the same height, and it is only 2 ft 8 in wide. The same hydraulics as the 1930ES make this machine quiet and a low-maintenance piece. It fits through most doorways and has an extendable platform. Genie’s GS-1930 is an electric scissor lift on the small end, with a 25 ft working height and a total lift capacity of 500 lbs. This lift works best indoors on flat terrain, although it is capable of working outdoors, too. It has non-marking tires and offers AC power to the platform, so you can plug in tools while you’re up on the lift. At only 2 ft 6 in wide, it will fit through most doorways. 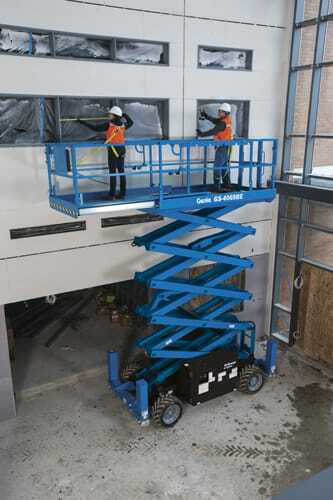 The Genie GS-2632 model offers you a 32 ft working height and a lift capability of 1,000 lbs total. The platform rolls out for extra room, and it offers AC power. The width is only 2 ft 8 in, which makes this lift easy to maneuver in tight indoor spaces. Nonmarking tires also make this lift a popular choice for indoor use. In 2013, Skyjack produced its 100,000th SJIII 3219 scissor lift model, a milestone which makes this scissor lift one of the world’s most popular scissor lift models. The Skyjack SJIII 3219 is a versatile electric scissor lift that can handle some indoor and outdoor jobs. The raised platform height is 19 ft, giving it a 25 ft work height. The scissor lift itself is compact, at only 39 in high when fully lowered. It can handle a 30% gradation, and it takes 25 seconds to lift its full load capacity. According to BigRentz data, nonmarking tires are one of the most popular features a scissor lift can offer for indoor jobs. Electric power is also more versatile, and therefore more used, than diesel or dual-fuel power, since an electric scissor lift will work both indoors and outdoors. An engine-powered scissor lift is appropriate only for outdoor use, giving this type of life a more niche use. However, both narrow and wide platforms make the cut. For taller scissor lifts, wide platforms are more popular. For shorter scissor lifts that need to fit in tight spaces, professionals seem to choose narrow platforms. Indoor job sites often require narrow platforms and small scissor lifts, which are sometimes the only lifts that will fit in a furnished space, such as between warehouse shelving. 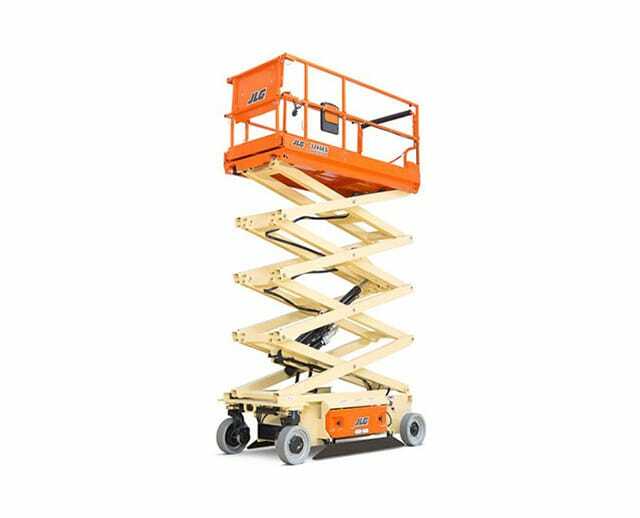 Reviews of scissor lift models and specific companies can help you identify the features you want on your next scissor lift rental. Learn about popular models, popular brands, and a few lesser-known scissor lifts by exploring the following model and company reviews. Chainsaw Journal is a consumer review site affiliated with Amazon, and it offers comprehensive reviews of outdoor equipment, including aerial lifts. The journal reviewed the Genie GS-1930 favorably in 2016. Positive elements of the lift include the speedy raising and lowering times (16 seconds up and 22 seconds down), its zero-emission electric power, and its quiet operation. Onboard diagnostics also help you figure out quickly whether the lift is experiencing a problem. The extra 36 in platform rollout is a benefit to the platform’s typical 5 ft 4 in length. This extension means you can reach more objects once you’re elevated without having to come down and move the scissor lift. Safety features keep you from driving too fast while elevated. However, Chainsaw Journal reports that driving the lift while the platform is lowered is quite easy. Chainsaw Journal has positive comments about Genie and about using scissor lifts instead of scaffolding in general. The journal notes that Genie is a smart model to rent for two-story indoor jobs. Lift and Access provides news, information, and reviews for the North American construction market. The site’s video review of the Aichi SV1930C, a lift distributed by Toyota Material Handling, reports the lift is easy to use with a fast lift time. Custom Equipment’s Hy-Brid offers the HB-830, a low-level lift that Lift and Access reports is a heavy-duty lift. This self-propelled unit can reach 14 ft. When you’re choosing a lift to rent, knowing whether a company trains you to use the lifts and offers repair services, is an important factor. 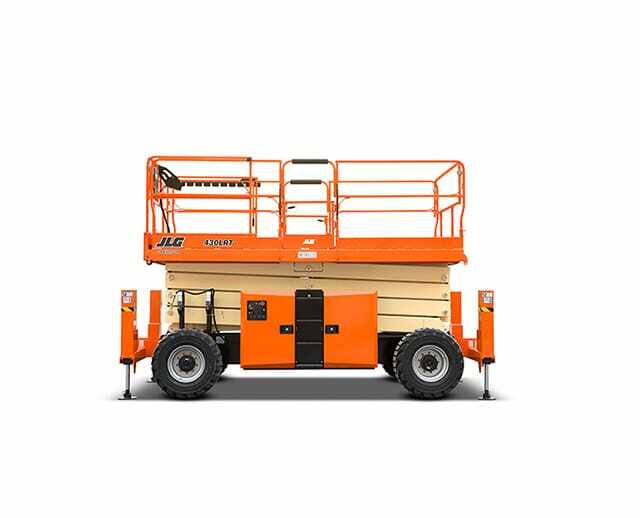 Side By Side Reviews revealed that although almost all reviewed companies offer repairs, Genie and JLG are two of only three companies that offer training to use their lifts. Comprehensive lift use training is essential to staying safe on job sites, and renting lifts that also include training opportunities is the best way to keep both your site secure and your employees safe. Another company offering training is Randall Industries, although you should note that Side By Side did not evaluate Skyjack, Mec, or Haulotte. Scissor lifts are useful for specific job environments. Indoors, they’re the most lightweight and maneuverable choice. Outdoors, they do well on gradation and uneven surfaces, and they won’t extend into other buildings or extend over different parts of a construction site. Consider the equipment you’ll be carrying up and down the lift to choose the load-bearing capacity. Calculate the height of your job by figuring out where someone needs to be to work comfortably. Remember that you need to move the lift around your job site, too, so measure your narrowest doorways and tightest halls. Renting multiple scissor lifts that fill all your needs can be more economical than buying them. Buying can be expensive, and you could be left with equipment that may not work well for every job you have. Spaces such as schools, libraries, and hospitals often have higher ceilings or larger storage areas that require routine maintenance. Whether you need to access ductwork through a dropped ceiling or add a new coat of paint to a school gymnasium, the right size scissor lift will allow you to complete this work easily. Consider a scissor lift with an extendable lift platform if you’ll be doing maintenance or painting. This extended platform can give you more room to move about the job site, and you’ll need to move the scissor lift itself less frequently. Of course, you have to balance the platform size with the overall size of the lift. Since you’re working indoors, the lift needs to fit through doorways and around corners. Moving between the tall shelves of a warehouse is a job for a scissor lift. Since warehouses need to use every amount of space available, leaving space at the top of shelves empty isn’t an option — neither is leaving aisles wide to accommodate larger lifts. Since you can’t place scaffolding or ladders in warehouses, your best option is to use a scissor lift. Remember to add about 5 ft or 6 ft to the platform lift height to reach the workspace height. A person standing on a 19 ft lift will be able to reach 24 ft or 25 ft safely. Remember to check the weight of the scissor lift you rent before you bring it inside. Mezzanine floors and elevators can lift only a certain amount of weight. 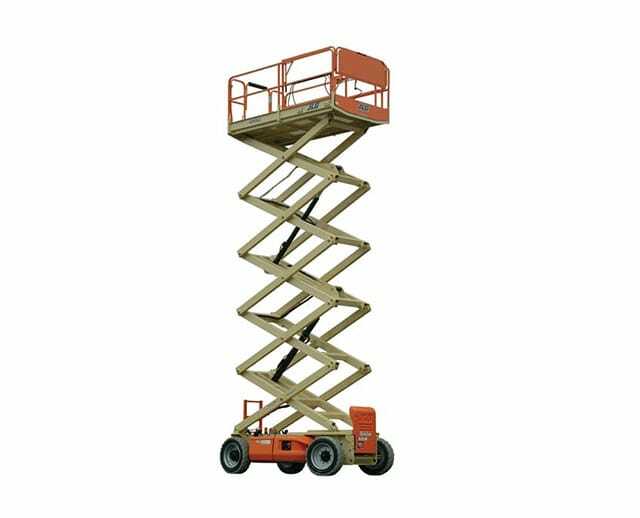 Usually, you can rent a scissor lift that comes in under the weight requirement. Certain types of flooring, such as tile, may crack beneath a lift’s weight. You should always check the amount of weight your flooring can handle before maneuvering heavy equipment on it. Use a scissor lift to reach an advertisement billboard or a company’s exterior sign. Since signs are usually roadside or in parking lots, the small amount of space a scissor lift occupies, plus the 100 percent vertical movement, makes the scissor lift the best choice for altering a sign. If you rent one with a work platform that’s the same width as the sign, you shouldn’t have to move the lift as you work. Although some outdoor jobs need other types of lifts, scissor lifts are great because they can operate on some steep slopes. Rough terrain models by recognized scissor lift brands are able to handle gradations up to 50 percent, allowing you to safely reach several stories up while braced on a hill, slope, or uneven terrain. This safer option offers an alternative to bracing a ladder on uneven ground. Another reason to use a scissor lift on outdoor job sites involves space concerns. 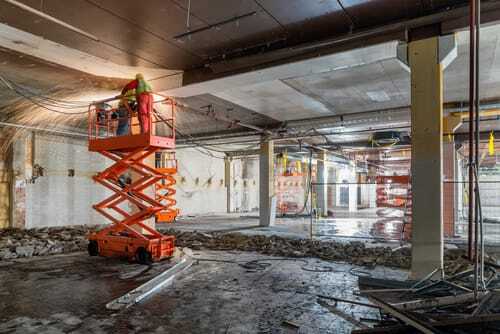 While at the beginning of a construction project you may choose a boom lift or a telescoping lift, as the building goes up, your space becomes more limited. 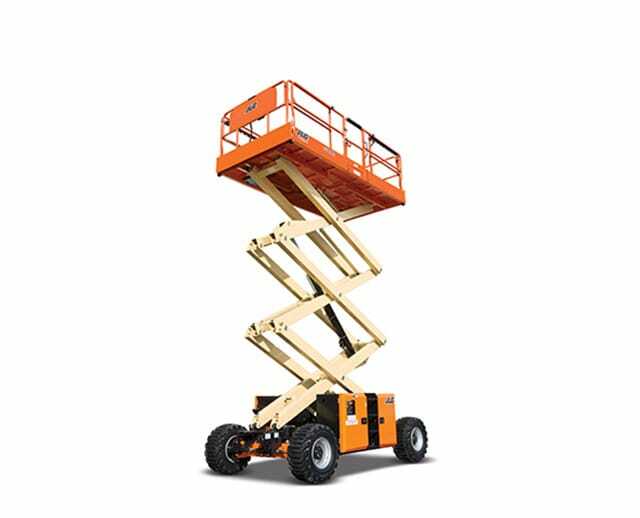 Rough terrain scissor lifts often have a smaller footprint than telescoping or boom lifts, which need considerable stabilization before the lift platform goes up. A scissor lift may not go as high as some boom lifts, but the amount of vertical space you need to operate the lift is also considerably smaller. For reaching up a few stories on the exterior of a house, a scissor lift is a great choice. Operating in courtyards or in alleyways between buildings are other situations when a scissor lift makes sense for outdoor use. Many possible hazards exist when using scissor lifts. These issues aren’t meant to dissuade you from using a scissor lift. Rather being informed about what can happen will help you maintain safety protocols while using rented scissor lifts. You have a painting job indoors, and one of your employees is up in the scissor lift working on the ceiling. This employee isn’t wearing a safety harness in order to reach other parts of the ceiling. The individual is leaning out of the platform to avoid having to come down and move the lift. You can see how this employee could easily fall from the lift in this scenario. Something bumping into it or the employee leaning too far out of the platform could be enough to cause a fall. Riding in a lift while it’s extended and moving is another fall hazard. If the person on the platform isn’t careful, the individual could run into beams or other parts of a construction site capable of inflicting a blow to the head or chest or a fall from the platform. While you’re on the lift platform moving up to the lift’s full height, you need to be aware of the job site. If the platform gets too close to an object, the operator of the lift could get caught between the lift platform and the object near it. The same can happen if you’re on the ground moving the lift and not paying attention to who’s working around you. A person can easily become crushed by construction equipment when an individual isn’t paying attention to the obstacles around the site. Although you can use scissor lifts outdoors, you need to make sure that the lift is rated to handle gradation before you stop it on a hillside or on uneven ground. However, the ground itself has to be stable. Gravel or sand on a gradient will not support a lift, and this type of material could cause the lift to become unstable, endangering whoever is on the platform. Never have a lift to sit on a gradation it isn’t rated to handle, and be diligent about the quality of the ground on your outdoor job sites. Another problem with stopping the lift on unstable ground is that the lift could possibly fall. If the lift is fully extended and the platform is loaded with equipment, the platform becomes heavier than the bottom of the lift. The unstable ground could be enough to cause the lift to fall sideways, crushing people or equipment at your job site. Trying to move a lift carrying heavy material while fully extended could also cause the lift to tilt and fall. Even if the lift sways and stabilizes, the equipment you have on the platform could fall out, striking people on the ground or breaking upon impact. Working near power lines presents a challenge. If something malfunctions with the lift, the person on the platform could come into contact with power lines and become electrocuted. Operating a lift too close to power lines on a job site can cause happen. Using a scissor lift to work on low power lines without wearing the correct protective gear also presents a hazard. Consider this scenario: You’re in a hurry on your job site, and you haven’t cleared the floor of electrical wires before moving your scissor lift. If you run over an exposed wire, you could electrocute the person operating the lift or anyone standing nearby. You should always ensure that wires are covered or out of the way before driving your lift through an indoor or outdoor space. When you understand the types of accidents that can happen with aerial lifts, you can put the right safety protocols into place. Confidently use scissor lifts on your job site with good safety practices. Safety can help you avoid accidents when you rent this type of equipment. How do you prevent running into power lines or placing your lift on uneven terrain? Evaluate your job site before you bring the lift to the site. A visual inspection is a powerful tool to keep your workers safe while they use scissor lifts. If working indoors, look up and assess any ceiling parts, shelves, or other objects that may endanger the person on the lift. If outdoors, check the ground’s stability and anything hanging or exposed on the construction site that is at the height of the lift platform. Although moving on the lift platform while wearing a safety belt isn’t as comfortable as not wearing it, the belt is important for safety. When a worker is wearing the safety belt while on the lift platform, the belt will catch the worker if the person starts to fall. A harness can also stabilize someone if a trip occurs, preventing a small accident from becoming a disaster. When you’re pressed for time, lowering the lift to allow a worker to step off the platform before you move could be viewed as a hassle. Moving an extended scissor lift while someone is using the platform is dangerous. Lifts that are extended are more difficult to drive than lifts that are compact. Additionally, the operator of the lift won’t be able to pay attention to both the route ahead and possible hazards at the top of the lift at the same time. OSHA (the Occupational Safety and Health Administration) recommends that the lift have a 10-foot clearance of any energized lines overhead. If you’re working near power lines, always leave 10 ft (or 3 meters) of clearance between the lift platform and power lines. Remember, these lifts are made of metal. Even if your workers don’t come into direct contact with the power lines, the lift could. The metal will conduct the electricity and electrocute anyone touching the lift. Also, make sure that your employees have clearance when operating a scissor lift indoors. Trying to fit between beams or behind obstacles is dangerous. If the lift moves even slightly, an employee could get crushed. On construction sites, hard hats are a must, but you should consider wearing head protection even when using a scissor lift for other tasks. The possibility of hitting your head while in an elevated position, even in a maintenance or warehouse setting, is substantial. A hard hat is designed to protect your head from the worst impacts. If you’ll be working near power lines, you need to wear the right protective gear. Along with leaving the correct amount of clearance, safety gear is the best way to protect yourself from coming into contact with activated lines and becoming electrocuted. OSHA has a list of Safe Work Practices to follow when using an aerial lift. These practices include the information listed above for contractors and construction workers to use. Always follow professional regulations when renting and operating aerial lifts. Remember that a worksite accident can become expensive for employers, and an accident can be devastating for an injured worker and that individual’s family. Investing in safety protocols, including taking extra time to ensure you’re using a lift correctly, is the best way to prevent these hazards. Ensure your workplace safety standards are up-to-date by ensuring that your employees are trained to operate aerial lifts. Official training programs for aerial lifts are available both through some of the companies that manufacture the lifts and through organizations such as OSHA. Getting your employees trained to use scissor lift equipment is one of the best ways to ensure that everyone at a job site complies with safety protocols and operates equipment in the correct way. Scissor lift accidents can be scary, but you can decrease the likelihood that any of your employees will experience one with proper training. OSHA.com (not to be confused with the government agency OSHA) offers outreach training for construction workers. Although this training doesn’t focus solely on lifts, the safety information you learn in the OSHA courses applies to accidents that can happen on scissor lifts. When you complete an OSHA online training course, you earn a certificate from the U.S. Department of Labor. The 10-hour course is $89, and the 30-hour course is $169. You take the online courses at your own pace, although you need to complete the course and the ending survey within six months to get your certificate. You also receive free study materials from OSHA. Register online at OSHA.com. You can purchase Genie Lift Pro Online Operator Training materials directly from BigRentz. These web-based courses satisfy the requirements of OSHA, ANSI, and CSA. When you take the Genie training courses, you’ll be certified to safely operate Genie aerial lifts, including scissor lifts. Choosing the training program offered by your equipment rental company is advantageous. You and your employees will be trained on the equipment that you can use at your sites, and you will be most familiar with the rental company’s preferred brands. To register for the courses, call (888) 325-5172. You take these courses online at a pace you can handle. Videos and graphics can help you process the information presented. At the end of the training program, you take an exam. You then receive a Genie Lift Pro aerial access card, which shows you’re certified to operate aerial lifts. Sign up with JLG University to get operator training for aerial lifts. You can register for online classes, or you can take classes in person with certified trainers. Register with the AccessReady program for free to see what classes and instructors are available in your area. Go to the JLG University website at jlgu.jlg.com. Consider getting some of your employees certified as aerial lift trainers. The Train the Trainer courses, offered by industry leaders such as Genie, both certify people to operate aerial lifts and give them the tools to train other people to use those lifts. Genie’s Train the Trainer program complies with OSHA and ANSI regulations for training operators and other trainers. JLG’s Train the Trainer program takes place in a classroom over a three-day period. If you’re a contractor with a large staff and you frequently rent aerial lifts, consider having a few employees become trainers. When you do, you can more easily onboard new employees and get current workers up-to-date on their aerial lift training. Plus, someone certified to train others will be comfortable teaching safety techniques and will be familiar with safety protocols surrounding scissor lifts. The movable scissor lift that we think of today was designed in the 1960s. It’s called the pantograph scissor lift, and it uses two posts to lift a platform into the air. The patent for this scissor lift mechanism was filed on December 26, 1963, by Charles Larson. In April 1966, Larson’s patent was granted, and by the 1970s, the scissor lift became commercially available. JLG was the first U.S. company to introduce a commercially available scissor lift in 1976. JLG was able to turn Larson’s patented mechanism into a manufacturable lift. Around the same time, companies around the world began developing scissor lifts, although JLG was officially the first to do so. Japanese company Meikikou made an agreement with American Manufacturing to produce scissor lifts, and by 1977, it had released the N-series scissor lift. In the early 1980s, Hy-Brid lifts designed and produced the first “2-in-1” scissor lift for mausoleum use. Before the pantograph scissor lift, scissor lifts used a single post to lift platforms into the air. This design came about in 1925, and although people made the best of it, the single post design was unsafe and difficult to use. The double pantograph, the X-shaped pattern supporting the platform from both sides, is far more stable and is easier to raise and lower safely. The reasons we still use a variation of Charles Larson’s design today are safety and convenience. The pantograph scissor lift offered additional security and support with its lattice lift design. Today, the pantograph scissor lift uses hydraulics for lifting and lowering the platform, a safer lift variation. The pantograph design also folds up neatly, allowing people to easily move the folded lift platform among locations. 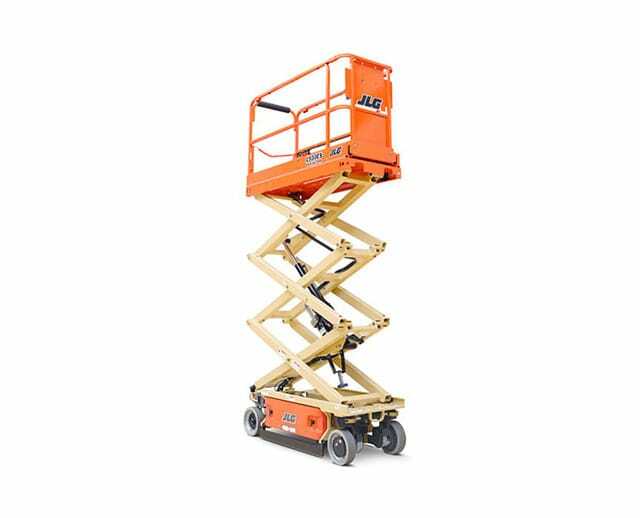 JLG has been instrumental in creating the scissor lift design used today. 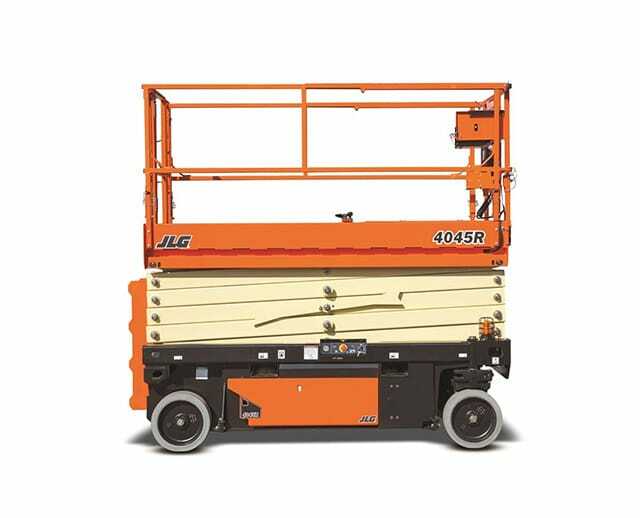 A year after the first scissor lift came off the production line, JLG expanded to Europe, with headquarters in the United Kingdom. In 1981, the company released scissor lifts and boom lifts with oscillating axles for better maneuverability. In 1998, JLG produced its 50,000th scissor lift. Dozens of patents relating to scissor lifts exist, both in the United States and across the world. Many of them improve upon small parts of the already existing design. Many patents expire after a maximum of 20 years, so any manufacturer can now use the earlier patent designs to improve scissor lifts by any manufacturer. The more recent patents may belong to one manufacturer, giving the manufacturer an advantage with a certain type of scissor lift construction. Charles Larson’s original patent, awarded in April 1966, is available for public viewing. The patent stated that Larson wanted to improve the existing scissor lift in a practical way while offering simple construction. Larson described interconnected scissor arms as a key component of this lift, and he provided diagrams to illustrate his point. View this patent to see the birth of the modern scissor lift. Note that Larson’s design is not the same lift that JLG manufactures. Larson designed a scissor lift mechanism which JLG was able to turn into a commercial lift. Larson’s original patent assignee was Jeddeloh Bros. Sweed Mills Inc., which, at the time, was a saw manufacturing company. Bert J. Sikli improved on the scissor lift design in a patent published in October 1976. Adding hydraulics to the scissor lift mechanism allowed this new scissor lift design to be raised or lowered to any specific height. The argument for this design is that this style of scissor lift is simpler and more economical than prior art patents for scissor lifts. This patent, published in November 2014, is for an invention by Martin Olesen that changes how power is distributed through the scissor lift while the lift is raised or lowered. The assignee for this patent is Develtex ApS, a Danish company specializing in mobility products. On this short list of patents, this patent is the only one that has not reached its 20-year period for expiration. Companies that manufacture and produce scissor lifts often have several patents for improvements to scissor lifts. Companies work with inventors, and they are listed as assignees of patents for scissor lift improvements and mechanisms. Draper Inc. carries two scissor lift patents. Herkules Equipment Corporation has almost a half dozen patents relating to the scissor lift alone. How easy is it to maneuver a scissor lift? Powered scissor lifts require no special equipment to move. Since you drive this lift from place to place around a job site, the best way to make sure the lift is easy to move is to ensure you have enough space. You can achieve this security by measuring your job site, then renting a lift that will easily fit in the spaces where you’ll be using it. Remember that lifts are much more difficult and dangerous to drive when they’re fully extended. Always make sure no one is on the platform and that the platform is fully lowered before driving the lift. What if I rent the wrong size scissor lift? If you rent a lift and discover it’s the incorrect size for your job, have BigRentz pick it up and rent one that fits better. Don’t try to use a lift that’s too large or too small. When using a lift that’s too large, you risk running into obstacles or people while trying to move it through your site. If you use a lift that’s too small, your workers may need to stretch and extend to reach high enough to do their work. Reaching and leaning increases the risks of falls from the platform. Take measurements of your space, including doorways and hallways. With these measurements, you’ll know how much clearance the scissor lift has when you drive it through your site. You also need to know the type of height required for the lift you want to rent. You do not have to extend the lift as high as it will go: One lift will suffice for a job that requires work on a few different levels. Do I need to worry about workplace accidents? Many contractors and construction workers use aerial lifts every day without any incident. You should be diligent about your safety protocols. Always train your employees, and pay attention to how lifts are being operated, especially if you are using a specific type of scissor lift for the first time during a job. Register yourself and your employees for Genie training through BigRentz so that your team has the operational knowledge necessary to safely use scissor lifts on a job site. 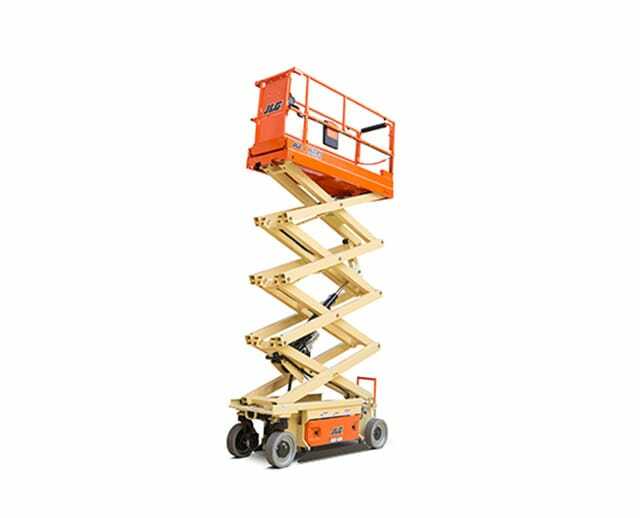 What are my scissor lift rental options? At BigRentz, you can rent equipment by the day, the week, or the month. Browse our catalog of scissor lifts and select the correct one for your job. Enter your location online and complete the requested booking information. Choose the days you’ll need the scissor lift, and choose an hour-long delivery window. BigRentz will drop off and pick up the scissor lift for you. For most equipment, next-day delivery is available. Scissor lifts are a popular type of aerial lift platform that your employees can learn to safely operate. Reach ceilings, windows, top shelves, and other elevated spots with the correct size scissor lift. Enjoy the patents and technology that have come together to create the superior products offered by top brands today. You can rent the best types of scissor lifts from brands such as Genie when you choose BigRentz as your scissor lift rental resource. With a wide variety of scissor lifts available, it’s almost impossible to buy one and have it work for every job you do. That’s why renting a scissor lift through BigRentz is economical. BigRentz handles the maintenance and storage associated with a lift, which are large additional costs that some buyers may forget to consider. Additionally, you can rent different lifts to suit each job you have, whether those jobs take place outdoors or indoors.